Settlers struggled to sustain themselves day to day. People such as W.W. Bass, John Hance, the Kolb Brothers, the Cameron Brothers, etc. all had to work from the ground up upon reaching the rim of the canyon. Many began with hopes of success in mining. The land initially promised fruitful results which were not unprecedented but were insignificant in comparison to the profits that laid in the tourism industry. As time went on, many turned to this thriving enterprise. 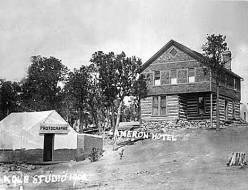 Rudimentary hotels and camps were built along the rim to lodge the few tourists that made their way to the canyon before the introduction of the railway. The hosts themselves lived there year-round, caring for their families, hunting for food, transporting water, and attempting to renovate their sites. One cannot tell the stories of the people who lived in the canyon without telling the story of their livelihood: tourism. 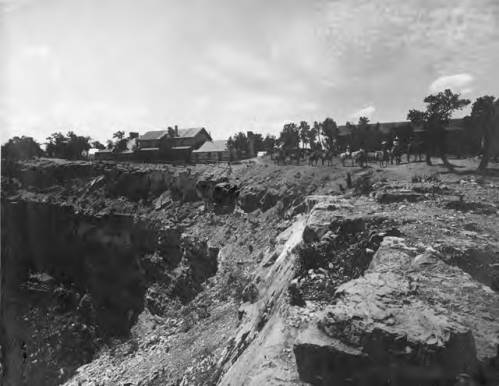 As people traveled to the west coast for the gold rush, many backtracked to Arizona and the Grand Canyon. Almost all early tourism influencers came to the area with mining claims. Upon seeing the grandeur of the area, they all soon came to realize that the most profit rested in tourism. William Wallace Bass, Pete Berry, John Hance, and Buckey O’Neill were among the first to stake their claim. The budding tourism industry capitalized on scenic vistas and expansive landscapes. There was a trade-off: capital gain in exchange for isolation. 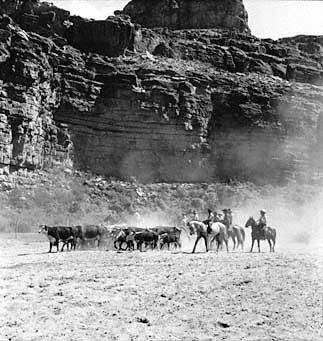 The rim was free range for these settlers but required them to be completely self-sufficient in true wilderness. Historic photographs show the amenities available to those who lived there. Homes were modest, handmade cabins with minimal decor. Life was simple and focused mainly on daily tasks required to stay alive. Supai - Round-up pic on rodeo ground 8/41.